On my honour I promise that I will do my best to do my duty to God and my Country; To help other people at all times; To obey the Scout Law. Fuq l-unur tiegħi nwiegħed li nagħmel ħilti biex naqdi dmiri lejn Alla u Art Twelidi; Biex ngħin lill-ħaddiehor kull ħin; Li nobdi l-liġi ta' l-iScouts. I promise that I will do my best to do my duty to God and my country, to help other people. To obey the Cub Scout Law. Inwieghed li naghmel hilti biex naqdi dmiri lejn Alla u Art Twelidi, biex nghin lill haddiehor, li nobdi l-liġi ta' Cub Scouts. I promise to do my best, to love God, to help other people and to follow the Beaver Motto. Inwiegħed li nagħmel hilti biex inħobb lil-Alla, ngħejn lil-ħaddieħor u ngħix il-Motto tal-Beavers. A Scout is loyal and obidient. 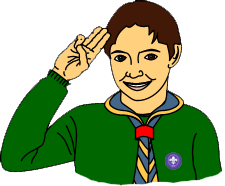 A Scout is corteous, kind and considerate. A Scout is cheerful in adversity. A Scout makes good use of time and avoids waste of, and damage to, property and environment. L-unur ta' Scout għandu jkun afdat. Scout hu lejali u ubbidjenti. Id-dmir ta' Scout hu li jkun ta siwi u għajnuna għal ħaddieħor. Scout hu ħabib ta kull ħadd. Scout hu dħuli, ħanin u jaf jagħder. Scout izomm ruħu rassenjat f'kull tiġrib. Scout jagħmel uzu tajjeb mill ħin u ma jaħlix jew iwettaq ħsara fil-proprjeta u l-ambjent. Scout hu nadif fil-ħsieb, fil-kliem, u fl-egħmil. Scout hi lejali u ubbidjenti. Scout hi ħabiba ta kull ħadd. Scout hi dħulija, ħanina u taf tagħder. Scout izomm ruħa rassenjata f'kull tiġrib. Scout tagħmel uzu tajjeb mill ħin u ma taħlix jew twettaq ħsara fil-proprjeta u l-ambjent. Scout hi nadifa fil-ħsieb, fil-kliem, u fl-egħmil. A Cub Scout always does his best, thinks of others before himself and does a good turn every day. A Cub Scout always does her best, thinks of others before herself and does a good turn every day. Cub Scout dejjem jagħmel ħiltu, jaħseb għal ħaddieħor qabel għalih innifsu u jagħmel xi ħaga tajba kull jum. Cub Scout dejjem tagħmel ħilitha, taħseb għal ħaddieħor qabel għaliha innifsha u tagħmel xi ħaga tajba kull jum.